Discussion in 'Osprey Knife & Tool' started by Bmurray, Jun 3, 2018. 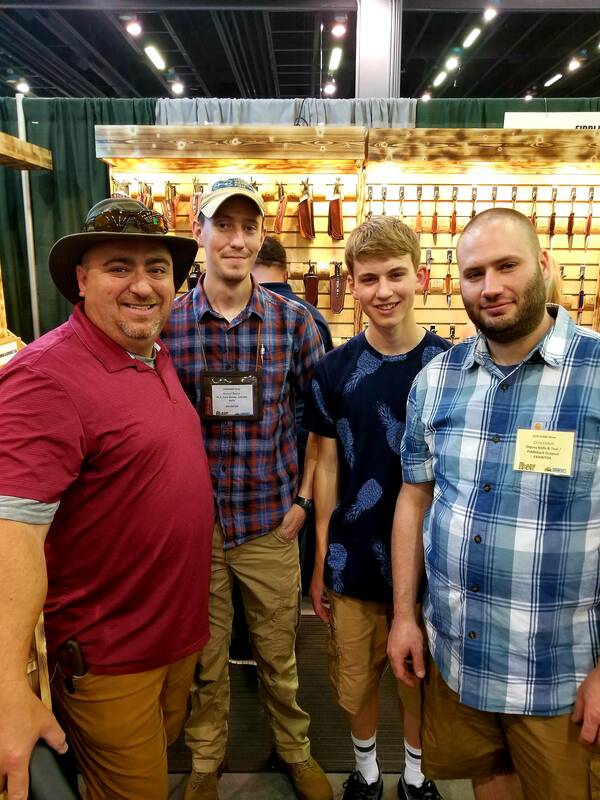 Just a quick pic of me, Russell Reece of Cohutta knife, my son Adam and Chris. For those who have not personally met Chris; he's not only a master at knife making but an all around good guy who's great to talk with. Looking forward to my next Osprey purchase. Also wanted to thank him again for helping me out on a small project. RobbieB, Osprey Knife & Tool, Comprehensivist and 5 others like this. Absolutely agreed. I got to chat with Chris Friday and Saturday. I'm admiring this Warthog that my buddy purchased from the Outpost and thinking about my next OKT. Bmurray, Osprey Knife & Tool, varga49 and 1 other person like this. Thanks for starting this thread Bob! I enjoyed getting to meet you and your son at the show and hanging out for a bit! I have a few pictures I will post up here in a few days. I am organizing all my photos and I plan on hitting the forums hard again in the next few days!